We all know that kids love to spit and spill their food and and for that they make bib’s. This baby bib is for a future tech geek as it has a print of a circuit board on it. This bib is made from absorbent polyester fleece and has a velcro closure for easy use. 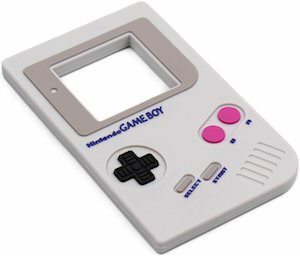 You can’t start young enough so start showing your little one some computer pats and that they fit on a circuit board that is printed on it’s favorite bib. 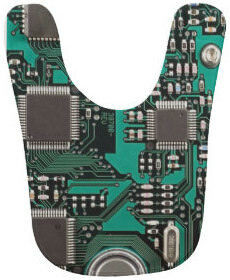 Make your baby happy with this Circuit Board Baby Bib. So you have a little one that need some footwear. Of course you want him or hear to wear the appropriate shoes that make a statement. These slip-on booties are have a little robot on them and that of course give the statement. 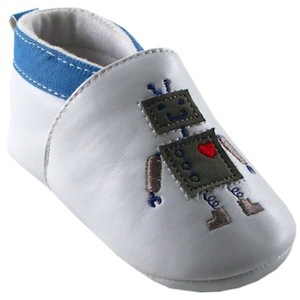 These robot booties have a non slip sole and and elastic top so that they stay on the feet without any effort. And these baby shoes come in sizes 0 – 18 months. So get your kid ready to become a robot engineer by getting them these fun Slip-On Robot Booties. There we have the starship enterprise just like we have seen it o so many time on Star Trek. A baby loves to be fed with this feeding system. It is a bib with lights that interact with the Starship Enterprise spoon witch of course has lights to. This unique Star Trek baby feeding system will make you baby eat more easily.